Fred IT Group (owner of eRx Script Exchange) is pleased to announce that it has been appointed by the Department of Health to lead the new national system for real time prescription monitoring which is designed to reduce the devastating impact of prescription medicine overdoses. According to a report released by the Australian Institute of Health and Welfare, in 2016 there were 1,808 deaths in Australia as a result of prescription medicine overdoses. The introduction of a national approach to real-time prescription monitoring will play a significant role in preventing prescription medication misuse and saving lives. Fredâ€™s recent experience in the developing of the Victorian real-time prescription monitoring system, called SafeScript, will be invaluable in extending real-time prescription monitoring to health professionals in all states and territories. Fred will design, build and deliver the software system for the National Data Exchange (NDE) component. This will include working closely with medical and pharmacy software vendors and jurisdictions to provide a consistent user experience for health professionals practicing in different environments and to reflect individual state and territory requirements in the national system. This entry was posted in News and tagged eHealth, RTPM on October 29, 2018 by Ashlea Elias. eRx Script Exchange investigates, does the Melbourne Cup really stop the nation? eRx Script Exchange today released data on the number of scripts processed during the 2016 Melbourne Cup, showing more than a 50% drop in script traffic compared with a standard Tuesday afternoon. Between 3:00pm and 3.10, when the Cup ran, the total number of scripts prescribed and dispensed across the country dropped by 50%, from a peak of 4,569 per minute to a low of 2,584 per minute during the race. Compared with the week prior to Cup Day, Cup Day saw a 44%-52% drop in total traffic sent to the exchange in the ten minutes from 3.00-3.10 pm. With Pharmacy approaching its two busiest months of the year for prescriptions, the number of doctors and pharmacies using eRx continues to grow. In preparation, eRx recently carried out network improvements to ensure that the speed of eRx remains fast. So when the horses arenâ€™t running and the pace in your pharmacy quickens, eRx will continue to provide efficiencies for your dispensing. eRx Script Exchange transfers prescription information between doctors and pharmacies. It is used by more than 20,000 doctors and 4,700 pharmacies every day and transfers more than 90% of the nationâ€™s prescriptions. This entry was posted in Uncategorized on November 3, 2016 by Ashlea Elias. One of the key problems facing Australian health care professionals continues to be the lack of consolidated medications information and an inability to easily share information between health professionals. When patients move between community care and hospital and aged care, the absence of good quality and up to date clinical data can contribute to these interactions becoming high risk, resulting in medication misadventures and unnecessary hospital readmissions. Medications reconciliation remains a largely manual process throughout Australia, providing a glaring reminder of the implications around the lack of shared clinical data on patient welfare. Thankfully, technology advances are making significant inroads into this problem, with the development of new applications such as the MedView Medicines Workspace. The MedView Medicines Workspace is an update on the original MedView pilot which took place in the Barwon Region of Victoria. The pilot tackled the problem around the lack of visibility of clinical data between different sectors, drawing together medication information from healthcare professionals in community, hospital and aged care settings. As a result and in an Australian first, health professionals who took part in the trial were able to see a combined list of patientsâ€™ prescribed and dispensed medications from across all of these settings. The pilot found that the sharing of clinical data, with patient consent, resulted in better medications management and safer outcomes for patients. MedView demonstrated the capacity of web applications to draw on data captured by existing systems, especially eRx Script Exchange, as a way of delivering extra value for health users and health professionals. In community pharmacy and GP clinics, it is not uncommon to see patients who are confused about what medications they should be taking according to their discharge summary. The MedView Medicines Workspace will help alleviate this problem by allowing doctors, pharmacists, hospitals, aged care settings and patients to have shared access to critical medicines information and services. With MedView Medicines Workspace, authorised health care providers will be able to view hospital data and pharmacy data at the same time, regardless of whether they are in My Health Record (MyHR) or MedView. They can then curate the data into a reconciled list, which can also be verified with additional input from the patient. Should the patient then present at a hospital or clinic, the clinician can view the reconciled list, complete with details on who curated the list and when, enabling a well-informed discussion with the patient about their medication. The MedView pilot was focused solely on providing a consolidated list of all prescribed and dispensed medications of a patient for practitioners to see. This was a significant achievement in itself, however there was no capacity to interact directly with the data provided and improve the quality of the information held. Four years on and taking it a step further, the new MedView Medicines Workspace will be a hub for authorised third parties to integrate with and deliver additional medications management services such as, medications reconciliation, medications monitoring and compliance monitoring – allowing clinicians to contribute data back to MyHR. The original MedView provided a consolidated medications list of prescribe and dispense events. The new MedView will provide services on top which will help drive meaningful use of MyHR data. 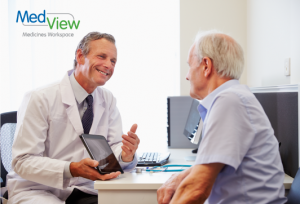 With the launch of MedView Medications Workspace on the horizon, we will be in a stronger position to ensure that the right health care professionals are able to see the right information at the right time. Above and beyond this, doctors, pharmacists and other clinicians will also be able to contribute to shared records, both within the workspace and in MyHR. Not only can this help to ease the burden of misadventure and unnecessary hospital readmissions, but it also has real potential to drive the meaningful use of MyHR. The key, as an industry, is to concentrate on bridging these information gaps to provide optimal care for patients. The ideal of one clear and perfect complete source of medications data is still a way off, however we must concentrate our efforts on how we can better work together as an industry to use data that is already being captured through systems such as electronic prescribing and dispensing. In this view, MedView Medicines Workspace and MyHR are not competing, but rather are complementary ways of building up clinical data at some of the high risk intersections between care settings. It goes without saying that any such understanding needs to be based on the view that data is only shared with consent, and that it is dealt with sensitively and with a view to improving health outcomes rather than commercial outcomes. The MedView Medicines Workspace is a prime example of how thinking creatively and applying innovation can deliver real life-saving potential and immediate practical value to the entire health sector. This entry was posted in News and tagged Medication Reconciliation, Medicines Workspace, MedView, MyHR on July 5, 2016 by Ashlea Elias. eRx Script Exchange today launched the results of its 2015 Pharmacy eHealth Survey identifying the business impact of ETP (electronic transfer of prescriptions) on community pharmacy since eRxâ€™s launch in 2009. A total of 740 pharmacies, representing 14% of Australiaâ€™s community pharmacy sector, took part in the survey, which ran in the first half of this year. The survey honed in on four key areas of dispensing and workflow, patient outcomes, challenges and priorities, and innovations for the future. This entry was posted in Uncategorized on October 13, 2015 by Ashlea Elias. Australia achieved a major milestone in patient safety today, reaching one billion prescriptions dispensed electronically through eRx. Electronic transfer of prescriptions improves patient safety by increasing confidence that the correct medications are being dispensed whilst also making dispensing faster. Electronic prescribing brings important safety gains as a result of the fact that prescription information, including patient and medication data, can be shared safely and securely between GPs and pharmacists. As a result, pharmacists no longer have to re-type medications or patient information, which makes dispensing faster whilst also increasing GP confidence that the correct medications are being dispensed. The one billion electronic scripts have been dispensed via eRx Script Exchange, Australiaâ€™s first and largest national prescriptions exchange. Since its launch in 2009, 89% (4,714) of Australiaâ€™s pharmacies and 76% (19,930) of Australiaâ€™s GPs have connected to and are using the exchange. â€¢ During peak periods, 25 electronic scripts are dispensed per second. eRx is delivered in collaboration with 24 of Australiaâ€™s leading medical and pharmacy software vendors. A further eleven are in the process of integrating and certifying with the network. This entry was posted in Uncategorized on August 4, 2015 by Ashlea Elias. This year itâ€™s at the Brisbane Convention and Exhibition CentreÂ from 3rd August to 5th August. Come and chat with us about our eRx Express and our new Paperless Claiming feature! This entry was posted in Uncategorized on August 3, 2015 by Ashlea Elias. We will be at the PSA Conference! We will be exhibiting at the Pharmaceutical Society of Australia Conference. This year itâ€™s at the Sofitel Sydney WentworthÂ from 21st JulyÂ to 2nd August. Come and chat with us about our eRx Express and our new Paperless Claiming feature! This entry was posted in Uncategorized on July 29, 2015 by Ashlea Elias. eRx Script Exchange welcomes the continuation of funding for the electronic transfer ofÂ prescriptions in the newly signed 6th Community Pharmacy Agreement. The new agreement includes $12.6 million for ETP funding in the 2015-2016 financial year. An additionalÂ spend of $48.3 million has been set aside for ETP and eHealth in the years following, subject to a costÂ effectiveness study in 2016. This entry was posted in News and tagged 6cpa, eHealth, ETP on June 2, 2015 by Ashlea Elias. Change your relationship with paper prescriptions. Save hours sorting –Â Let eRx Express tell you which scripts are missing. Take the headache out of audits –Â Simply search on your tablet, find it in seconds and email. This entry was posted in Uncategorized on April 4, 2015 by Ashlea Elias.